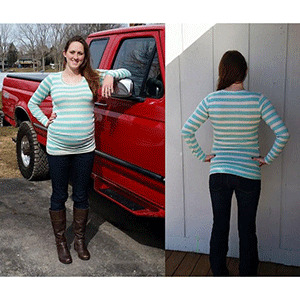 This beginner/intermediate pattern is that perfect wardrobe staple for growing bellies! With ruching and shaping on the front piece to give great maternity fit throughout your pregnancy. You MUST own the original Layer Me Up shirt. This pattern is available in sizes XXS to Plus 3X. Suggested fabrics are cotton jersey, cotton lycra or cotton ribbed.